The Sydney Symphony’s current Master Series concert was book-ended by nobility. Sir Edward Elgar’s orchestration of JS Bach’s Fantasia and Fugue in C minor, BWV 537 began the concert. Leopold Stokowski’s orchestration of Bach’s organ pieces glamourised them, by transforming them from, as it were, austere Lutheran pews into well-stuffed Edwardian Chesterfield sofas: Elgar’s treatment ennobled them while never diminishing their spirituality. This was a stirring opening to the concert and was well played, except at the culmination where the sound became slightly muddy, (at least in Row X of the stalls), due mainly, I suspect, to the Concert Hall’s acoustics. The second half of the evening was filled with Elgar’s Symphony No 2 in E Flat. The score bears the motto: “Rarely, rarely, comest thou, Spirit of Delight” from Shelley’s Invocation. Few of Elgar’s works convey more dramatically his emotional ambivalence; by the time of this work’s completion, Elgar was a national figure: he had garnered four honorary Mus.Ds, three LL.Ds, and around the time of its premiere, the Order of Merit. (He later declined a peerage.) Despite these worldly trappings, he was no jingoist and his two symphonies, as different as they are, are certainly not musical tributes to what has come to be regarded as Edwardian complacency and opulence. Despite its dedication to the recently departed King Edward VII, the Symphony seems to foreshadow an Edwardian sunset, albeit a glorious one, rather than the high noon of imperial might. Lady Elgar said, “It resumes our human life, delight, regrets, farewell, the saddest mood and then the strong man’s triumph”. The consensus of more recent criticism confirms the view that Elgar’s Second Symphony is suffused with doubt, pessimism and conflict, as much the confident panache of the type with which it begins. John Wilson and the Sydney Symphony negotiated the storm-tossed waters of the opening movement with vigour and propulsion. There were no becalmed longueurs but the so-called “malign influence” (Elgar’s own description) was beautifully captured by the cellos above a sinister, throbbing base, wafting in with ghostly pallor. The second movement is surely a lament or threnody for the late monarch, orchestrated in deepest mourning purple. The conductor and orchestra achieved a dignity and even, towards the end of the movement, reminded me of Siegfried’s Funeral March from Wagner’s Götterdämmerung. The will-o’-the-wisp Rondo (essentially a scherzo) is initially playful mercurial with a central section characterised by susurrating woodwind. The wind section covered themselves with glory in this passage. The final movement is full of the heraldic pageantry of a coronation procession and perhaps anticipates the new reign of George V. At last, we hear Elgar’s favourite nobilmente theme, on this occasion blazing and culminating with a triumphant top B on the trumpet. The surprise ending sees the “pomp and circumstance” banished to be replaced by a rather tender and rewarding glow. 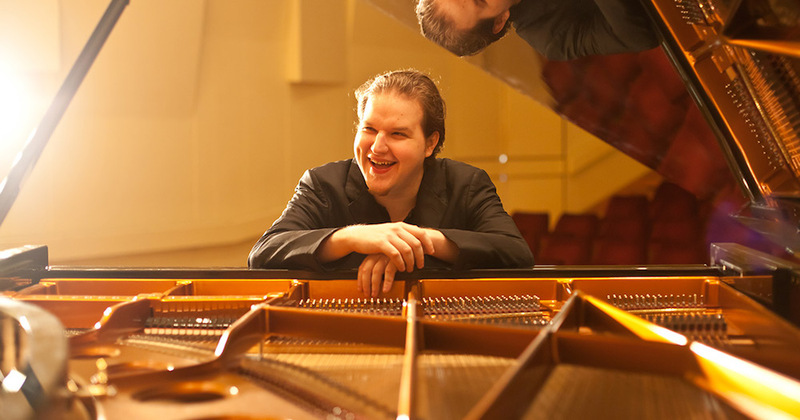 The middle work in the concert was Prokofiev’s Third Piano Concerto with the Winner of the 2016 Queen Elisabeth Prize, Lukáš Vondráček. Despite being one of Prokofiev’s more “mellow” works, there’s still a kaleidoscopic succession of brittleness, acerbity and manic energy, amid lyrical calm. Vondráček nailed every facet.